How to Support an Infertile Friend... When You're Not | How Do You Do It? It’s hard to know what to say or do when a couple we love learns that they’re infertile. It’s especially hard for those of us who had no trouble conceiving. It can become suddenly awkward, wondering what we’re doing or saying without even thinking about it to reopen the wound on their hearts. Being supportive without going overboard, especially when I have no real idea what they are going through, is a narrow road to walk. I’ve been in this position several times now, and I’ve learned a few general lessons about what to do. Assume nothing. This is the big one. 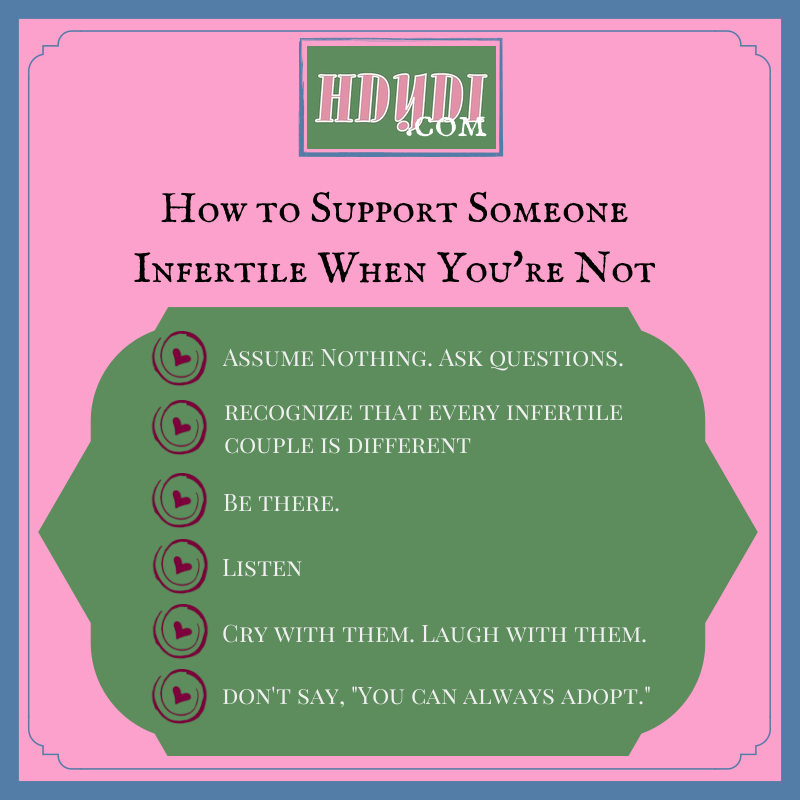 Don’t assume that you know how your infertile friends feel, what they need, or what comes next. Infertility is, by definition, a morass of the unknown. Ask questions instead of making general statements. Find out about your friends’ individual situations. Who are you telling about your infertility? Should I keep it a secret? What are your hopes and fears? What do you need from me? What do you want from me? Do you want to spend time with my children? Would you prefer adult-only time with me? Should I keep news about my pregnancy/children to myself? Do you want to talk about the experience? How do you want me to refer to the baby or babies you’ve lost? By name? As “the baby”? As “the fetus”? Do you want to acknowledge the date of their death? Do you want to acknowledge their due date? Recognize that every infertile couple is different. Knowing what one infertile couple has gone through gives you no understanding about the next couple you encounter. Every journey is different, from the emotions to the process to the eventual outcome. One couple may start seeking fertility treatment after 6 months of trying to conceive while another doesn’t think of their situation as infertility until 5 years down the road. One couple may be drawn together by their struggles while another is ripped apart. One wife may want to pour her heart out while another has a stiff upper lip. One husband may resent their inability to conceive while another doesn’t understand why his wife isn’t ready to adopt. I have two friends whose first pregnancies ended in miscarriage before they each gave birth to two healthy children. One considers herself the mother of 3, the other a mother of 2. Be there. Of course, friends are there for each other. It’s not so simple, though, when you’re a mother and your friends are battling infertility. Does it hurt them to have your kids around or hear stories about them? It can feel easier to just back off and let your infertile friends take their journey solo than to have difficult conversations. Do not retreat from your friends. Let them retreat from you if they choose to, but don’t assume that they’re better off without you. You don’t need to live nearby to provide support. A letter, card, phone call or text can mean as much or more than a hug or hot meal. Listen. It can be tempting to try to offer comfort in the form of positivity and advice. Resist that urge and listen to your friends. Let them communicate their pain, frustration, anger, amusement, bemusement, relief or whatever they may be thinking or feeling. Unless your friends are incredibly negative people, they’ve probably told themselves every positive truism in the book already. You can choose to be the friend who listens to them instead of telling them what they should do, should feel, should think. Cry with them. Laugh with them. Infertility can be devastatingly painful. It’s hard to look it in the face and let it rip at your heart if you have the option to avoid it. But if you really love your friends, you’ll let yourself feel their loss and pain alongside them. I’ve cried myself to sleep for my friends’ losses. I’ve felt the burn of anger on hearing news of yet another abandoned child, pondering the lack of justice that my friends, who would be such great parents, haven’t had the chance. And I’ve felt the flush of embarrassment and silly laughter hearing about the shenanigans that go on when the medical community gets involved in my friends’ private parts. Don’t say, “You can always adopt.” Trust me, they already know that adoption exists. Your friends will consider it when and if it suits them. Yes, we’re all well aware that there are many, many children in the world who need loving homes. But right now, we’re focused on your friends, and they’re focused on trying to conceive. If they choose to adopt, you can support them through that too. But it’s not your place to remind them about the adoption option. I’ve been in the unique position to offer two other kinds of support. Couples starting to use assisted reproductive technologies are often very concerned about the risk of conceiving multiples because of they know that there’s an increased risk of complications in a multiple pregnancy. My twin daughters serve to remind my friends that prematurity isn’t a life sentence, and I’m also sure to point out all the full-term multiples I know. 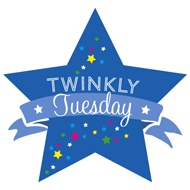 Our family also demonstrates that having multiples doesn’t have to be overwhelming. Having several kids all the same age has its own special magic. I have offered to be a gestational surrogate to 3 couples I’m close to. None of them has taken me up on my offer, but I am fully prepared to host their babies in my womb for 9 months if that would help them achieve their dreams. I take prenatal vitamins regularly. I’ve talked to my doctor about it. My daughters and I have talked about what surrogacy would mean, and they understand that the baby would not be their sibling, that I would be the “belly mom”, standing in for the real mom during the pregnancy only. 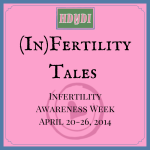 If you’ve contended with infertility yourself, please share your story with your friends. Listen, first, but also let them know that they’re not alone. You can support them in ways I never can. 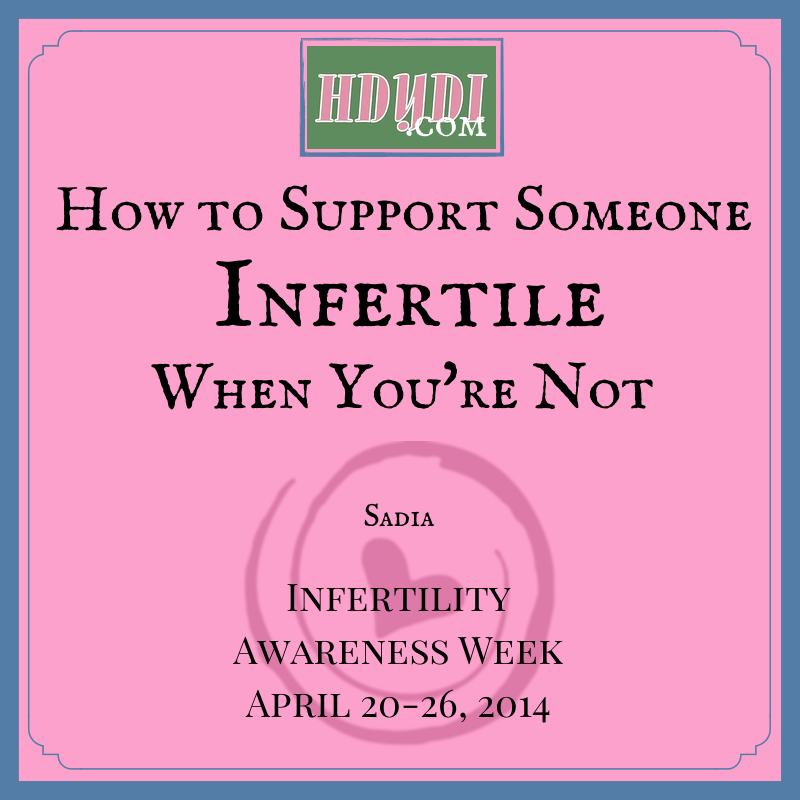 What advice do you have on how to best support couples facing infertility? This is awesome, Sadia. I think so many of these points can apply beyond struggles with infertility. Be it the loss of a parent, a child, a spouse…unemployment…financial struggles…I’m sure the list goes on and on. I know I’ve been guilty of keeping quiet because I didn’t know what to say or do in certain situations. I love your approach of thinking beyond that. I love this! The world needs more people like you – ones that can step outside of themselves and their experiences to truly, truly be there for their friends. Or in this case, even complete strangers. I applaud you for organizing this theme week because you saw a need. Next Next post: Buy One, Get One Free: Affordable Fertility Treatment!